Along with having possibly the longest title in JSFR history, these snacks number themselves among the snacks procured during the Great Snack Hunt of Ought Eleven. Not only that but this snack brand is ubiquitous between both stores we visited. Everyone likes Good Good Eat! I’m serious. I am quasi real time reviewing this snack because otherwise it would be gone before I got home. Someone (not to mention any names MyFavoriteGuineaPig) had to be physically separated from the snacks in order for me to have one or two left to munch and consider. In fact, this same person is considering whether Wei Lih Japanese Ramen Noodle Wheat Crackers-soy sauce flavored (out of Taiwan oddly) should sit in the hall of 5 wasabi pea fame. He might even be considering whether Wei Lih…you know what? These need a nickname. WL-JRNWC (soy) will do. Anyway, it may be that this same Pig thinks these are just as good as the 5 pea Cratz. I’m not sold on “just as good as Cratz” mostly because I’m not a huge soy sauce fan. 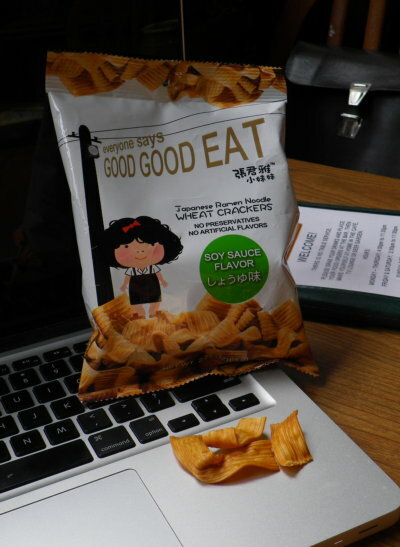 It’s a little too dark and salty a flavor for me and these crackers are absolutely awesome soy. They are also really light and crispily fun. If you could take a chow mein noodle and make it super thin and airy and crispy like a Rice Crispy bit and then give it a fun ribbony shape you would have these snacks. They are crispity, salty, soy, fun and delicious…especially with beer. I don’t think they are 5 pea Cratz awesome but they are certainly more than 4.5 pea awesome. 4.75+ perhaps, if I did smaller pea fractions. Rating of 4.5 Wasabi Peas (plus extra tasty awesome fractional pea points) out of a possible 5.